My name is Sebastien. I come from the land of baby ducks and was instructed in the art of magical duck ballet (it's a long story). I create comics, illustrations, often of a whimsical nature; sometimes a bit more cute, sometimes more wry. My drawings often feature animals and creatures with various recurring characters. I'm just starting out the patreon so I'll be open to your input as to what kind of things you might want to see, and will be open to suggestions!!! I'll be providing various things including early access to drawings, various types of sketches, and commentary about my process and thoughts on the drawings. One of my goals is to try attempting a longer narrative comic(s). I think it'd be a cool challenge, and if I can get financing through patreon it would help free up a bit of my time to explore and try some experiments with these type of longer projects! You will have my gratitude for supporting my work and the satisfaction of knowing you are helping support the creation of my drawings :) I'll make sketches, process drawings, and things of that nature available every once in a while at this tier. Access to sketches, process drawings, behind the scenes, and early access to my comics (I will post them here first). Thanks so much! You will have all access to all previous levels. Plus you will receive a free (including shipping) 8.5x11 print of your choosing every 2 months. Print selection can be viewed at my etsy store https://www.etsy.com/shop/bikeparts or you can also make requests if you don't see one of my images you want available in the store. 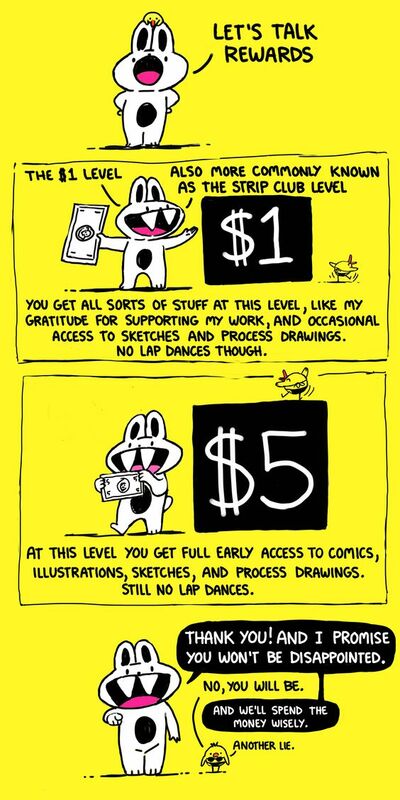 If I get to $150 per month I'll be able to spend a bit more time pursuing longer autobiographical comic vignettes and starting to work on a longer comic series. At this level I will post 1 new autobiographical comic per month. The focus would likely be upon childhood memories, but maybe expand down the line beyond that framework.